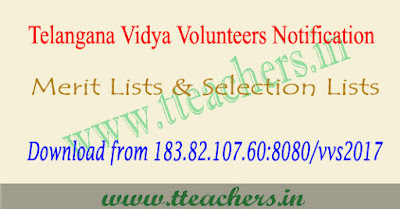 TS vidya volunteers merit list 2017 vvs selection list Telangana : The Vidya volunteers of Telangana which stands for DSE is certainly one of the most awaited result in the state of Telangana. 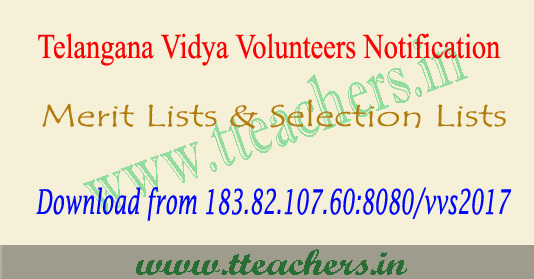 DSE is going to publish the TS vidya volunteers merit list 2017 of 31 districts on ** June 2017 which consists of various VV posts on their official web site http://183.82.107.60:8080/vvs2017/. DEO's will publish vvs final merit list through it;s official website on 10th June 2017 and display of final selection list by the deo's on 11th June 2017. So applicants can view of TS vidya volunteers merit list 2017 with mandal wise and district wise from these article. A few days back, DSE released the official vidya volunteers notification through official website. DSE has finished of TS vv's online application process between 1st July 2017 to 5th July 2017. Now they are plan to release tentative merit list of vidya volunteers with mandal wise and district wise through http://183.82.107.60:8080/vvs2017/. If any objection on merit list, applicant send reasonable objection through given format to DSE.